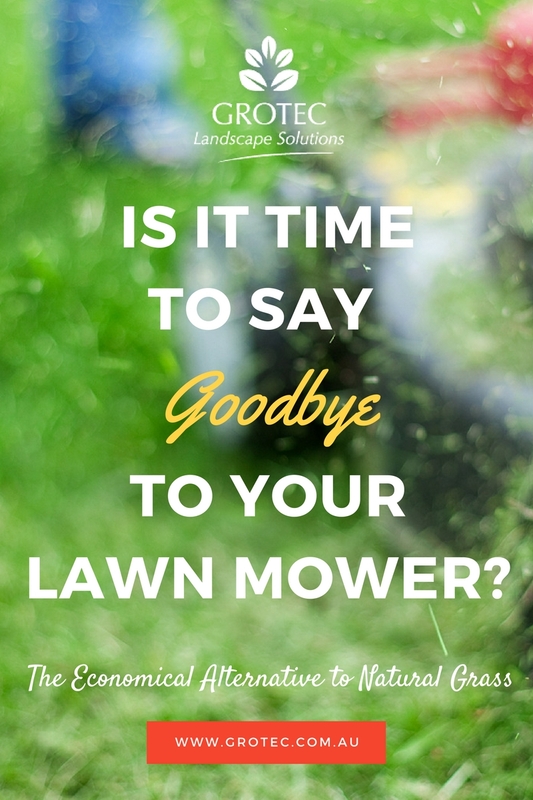 Is it time to say ‘Good-bye’ to your lawn mower? An Economical Alternative to Natural Grass is Fake or Artificial Grass: You just Spread It and Forget It. You hate mowing the lawn, but what can you do? The grass grows and never stops until the winter. Even then, it seems like the grass keeps growing – waiting for you, waiting for spring to hit. You spend most of your weekends filling up the mower with petrol and walking or riding around the lawn. You wished you could be doing something else. It doesn’t have to be this way. Did you know that you can ditch the grass in your yard and have fake grass instead? Consider the stunning examples of artificial grass available on the market today which are a fantastic economical alternative to Natural Grass. As an economical alternative to natural grass, “fake grass” or artificial grass is making a comeback. One of the reasons you might be hesitant about laying down artificial grass is precisely because it’s artificial. It seems like it should look artificial – but it doesn’t. Today’s artificial grasses have a blade-focused design that makes them look more like real grass than fake grass. Your lawn will look as real as your neighbor’s real grass. In fact, artificial grass comes with infill. Infill is sand or ground up rubber that mimics real dirt. This makes your artificial grass stand up taller so your lawn not only looks real but feels real too. A freak storm, an unexpected drought, and record-high temperatures won’t ruin your yard anymore. This economical alternative to natural grass will look just as good in 20 years time as the day you installed it. With real grass, you have to contend with bugs, moss, weeds, and other natural nuisances that can ruin the look, feel, and consistency of your yard. With artificial grass, not only do you rid yourself of the need to mow every weekend, you don’t have to deal with all of the yard problems everyone else has to deal with every day. If you’ve ever tried to maintain your yard, you know it’s an ongoing expense. You constantly battle mother nature, the neighbourhood kids, and even yourself with the costs of fertilising, mowing, and aerating the lawn. With artificial grass, you install it once, and you forget about it. It never needs to be watered, cut, or fertilised. You’ll never have to haul in sod to replace dead or rough patches, and the snow and summer won’t ruin all your efforts. Instead, you can enjoy your backyard without constantly worrying about trampling it or ruining it. Set up a hammock and relax. It really is an economical alternative to natural grass. It used to be that artificial turf was just for stadiums. Not anymore. Synthetic grass is springing up everywhere. Because of advanced colour and cut designs, it looks more like real grass than the bright neon stuff you’re probably used to seeing. That’s a big reason why many homeowners are considering it – it looks almost indistinguishable from the real thing. Because most Australians are busy people, they’ve found value in pulling up the old high-maintenance real stuff in favour of something that’s fake – yet it provides real value and enjoyment. It really is a fantastic and economical alternative to natural grass. Consider Fake, Artificial or Synthetic Grass – an economical alternative to natural grass. And tell your lawnmower to get stuffed! Follow us on Pinterest for more garden hints & tips!